Creator Michael Dolce announces rebranding of his studio, upcoming podcast and graphic novel projects. 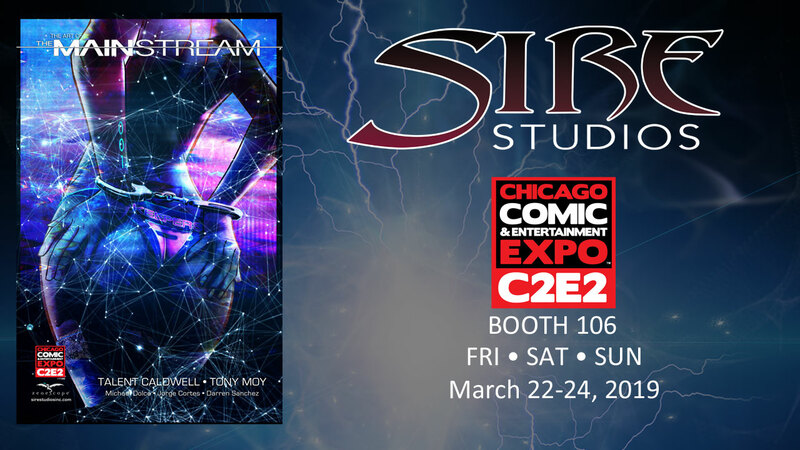 In exciting news announced at the C2E2 convention – taking place in Chicago, IL, March 22nd-24th – creator Michael Dolce officially declared an end to the long running web site home to his creations, Mikebooks.com, officially rebranding the company as Sire Studios Inc. and heralding the start of a brand new Multi-Genre IP Production company at sirestudiosinc.com. In addition to the rebranding, Dolce promises exciting new projects both in the comics field and beyond. In addition to the audio dramas, Dolce also promises more graphic novel projects in the works including a follow-up to the critically acclaimed sci-fi series The Mainstream. Look for the Sire Studios brand to extend to all future social media platforms and communications as the roll out is officially under way. Sire Studios Inc. is a premier Graphic Novel, Podcast and IP Production Company. Founded in 2001 as Mikebooks.com by writer, artist & podcaster Michael Dolce and officially rebranded in 2019, Sire Studios Inc. boasts an assortment of projects in the Comics, Podcast, Talk Show, Film and TV space. Comic Book credits include the recently sold-out sci-fi tale The Mainstream from Zenescope, Descendant from Image Comics and The Sire from After Shock Comics. All projects can be downloaded on Comixology, iTunes, and Amazon. The acclaimed podcast, Secrets of the Sire, co-hosted by Hassan Godwin, has been steadily growing in popularity since its launch in 2016 consumed by over 50K per a month.Podcasts receive global distribution on Apple Podcasts, iHeartRadio, YouTube, Google Play, Spreaker, Soundcloud, Stitcher and more. In 2019, Secrets of the Sire gained distribution on ROKU, Sonos, and Apple TV. Currently, Sire Studios Inc. is working on a number of new launches in both the graphic novel and podcast world. Meet the team behind The Mainstream at C2E2 this weekend. Get the exclusive Art of the Mainstream signed by the entire creative team and listen to creator Michael Dolce speak on Sunday at the Zenescope Panel. EXCLUSIVE! Get the inside info and never-before-seen artwork that made THE MAINSTREAM such a successful comic. Featuring all 5 exclusive covers, the regular covers, designs and the never-before-seen WATERCOLOR pitch version by Tony Moy, the ART OF THE MAINSTREAM is a must have to complete your MAINSTREAM collection. BONUS! These comics are signed by the entire creative team!